2.The line will promote tourism in the region. 4. Cabinet Committee of Economic Affairs approves the New Railway Line between Bahraich and Khalilabad, Uttar Pradesh. 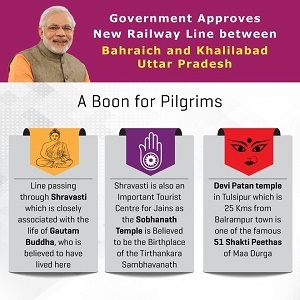 The new line serves 5 districts of Uttar Pradesh including 4 aspirational districts (Bahraich, Balrampur, Shravasti and Siddharth Nagar) and Sant Kabirnagar.